Welcome to our Making Reflection Meaningful Blog Hop! I'm so happy to be a part of this amazing group of teacher-authors and hope you enjoy our tips and ideas! I begin to have my students reflect on the past year by using video journals. Using videos for student journal responses is a great way to incorporate technology, while also enforcing 21st century learning. The video journal responses address various areas included in an infographic (goal setting, SMART Goals, resolutions, making positive changes, symbolism, etc.). I have students complete the infographic once they have finished the journal responses. You can find the Student Reflection- Video Journal Responses here. Another activity I use is New Year's Character Reflection Task Cards. This activity requires students to think critically about the character(s) from a story that have read or are reading, as well as to support their answers with evidence. The task cards can be used at any time in the year, not just around the holidays. For a free sample of these activities, click here. 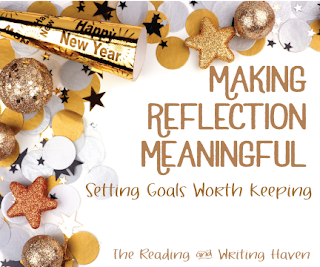 How do you reflect and set goals, not only for yourself, but for the classroom, as well? Those task cards look like a perfect "last week before break" kind of activity! Thank you! That's what I'm planning to use them for! I love the character task cards -- I'll need to get those for next semester! I wish I could do fun activities before break, but our school has final exams :[ . Oh, and thanks for the video showing how to put students into groups on Google Classroom -- I just started using Google Classroom last month and love it!! You're so welcome! I had to come up with something, so I'm glad this was helpful!